CD review: "Rise & Shine"
This review first appeared in the Nov. 1, 2007 issue of the North County Times. 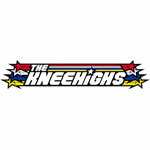 A second-generation hip hop group of under-30 young bucks, San Diego's KneeHighs have a decidedly old-school slant. Their version of hip-hop is full of funky horn charts, jazz grooves and fusion arrangements behind the rapped vocals. Oh, and a sense of fun. Hearkening back to early to mid-'80s rap, when the funk influence still ran strong, this CD reminds of Trouble Funk or Brooklyn Funk Essentials. It's an imaginative melding of sampled cuts, live playing, rapping, singing and harmony vocals. And the lyrics? Matrimonial chore-sharing, being grounded while still living at home, getting an education. Their positive take on life, top-rank musicality and apparent inability to conform to Hollywood's expectations about hip-hop may doom them commercially, but those same characteristics make the KneeHigh's new CD a mighty refreshing listen.